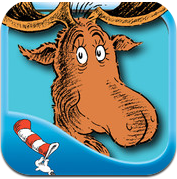 Thidwick the Big-Hearted Moose – by Dr. Seuss is the story of a kind hearted Moose. He offers a ride on his antlers to a small bug and the bug invites others onboard. This turns out to be quite a crowded fiasco! You can listen to the story or read it yourself. Either way it is a very amusing tale! Another feature is Autoplay, which will play through the book app like a movie! Oceanhouse Media consistently reinforces early reading readiness with their tap the screen and hear and see the word format. Kids love to tap and this book has lots of fun names to learn. In addition, the words are highlighted as they are read. Pages pan & zoom to enjoy the beautiful, original art of Dr. Seuss. This app is presented to us by Oceanhouse Media. Meet Thidwick the Kind Hearted Moose! An Antler Rider Hops on! Things are Just Starting to Get Crazy! This app is a great addition to your kid’s toolbox for life! The antics continue with quite a list of “riders”.